The second national Savanna Fire and Carbon Forum was held last month to support operational best-practice and the cohesive development of the Savanna fire and carbon industry. 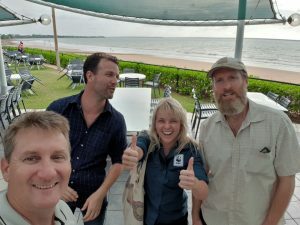 Rangelands NRM Program Manager (Kimberley) Grey Mackay, attended the event held in Darwin from 12-15 February. Grey said fire is the single largest threat to wildlife and productive land systems across the Kimberley. “Rangelands NRM has been at the forefront of driving collaboration and funding fire management activities directly,” he said. This Northern Australia Fire Forum brought together many stakeholders and fire managers from across the region in an effort to build partnership and share learnings. “The Northern Savanna Fire Abatement Industry is an emerging industry that is being led predominantly by Indigenous Rangers,” Grey said. The first day of the forum included a session on ‘sharing stories’ where Rangers gave their perspective and shared their ideas about opportunities and unknowns. “This included managing tourists during burning season and the social benefits and importance of just getting people on country,” Grey said. The next theme shared about how learnings from the Northern Australia model were being used to implement a fire abatement program including creating a carbon economy in Botswana. The final theme for the day got stuck right into the science and methodologies. “The new savanna fire methodology (2018) treats abatement the same, however, it now includes sequestration,” Grey said. The second day started by focusing on monitoring. “Traditional Owners described the importance of certain trees and animals in the landscape and how they can be used to tell them when to burn and how well they are burning,” Grey said. The final session was about the future of the industry, featuring a panel discussion addressing a lot of issues. Grey said the take home message was while there is opportunity – there is also enormous risk and a need for resilience/diversification.